Han Eun-suk, a 53-year-old housewife in southern Seoul, is meticulous in selecting her cooking ingredients, especially water. She never drinks tap water, citing an unpleasant chemical smell and safety concerns. Worried about her family’s health, she has installed a water purifier at home instead. “There’s a weird smell in tap water. How can you trust tap water that comes through old underground pipes? It’s always better to be safer,” Han said. Han is part of the majority of Koreans who are reluctant to drink tap water, and prefer to use a water purifier or purchase bottled water at home. According to a survey conducted by the Environment Ministry on 12,000 individuals in 2013, only about 10 percent responded that they drank water directly from the tap, whether it is boiled or not. About 55 percent said they drank tap water only after boiling to ensure safety. More than 30 percent of those surveyed responded that they distrust the quality of tap water because of concerns over old water pipes and water tanks. About 28 percent of respondents said they were worried about sanitation at reservoirs. But only about 55 percent answered that they were willing to drink tap water if all such concerns were resolved. Despite emphasis from experts who stress that Korea’s tap water quality is among the best in the world, public distrust over the quality of tap water has been prevalent for quite some time. According to a United Nations’ report in 2003, Korea’s water quality ranked eighth in the world, with its high-tech water treatment facilities and management. Finland topped the chart, followed by Canada and New Zealand. The U.S. took the 12th spot, the report said. To ensure water safety, the Korean government monitors tap water quality around the clock against a minimum of 59 criteria, including checks on residual chlorine levels, pH and various types of bacteria. Along with the mandated monitoring criteria, municipal governments impose their own higher water standards at their own discretion, with over 150 criteria. For example, Seoul City monitors 163 variables while Busan looks at 260, officials said. 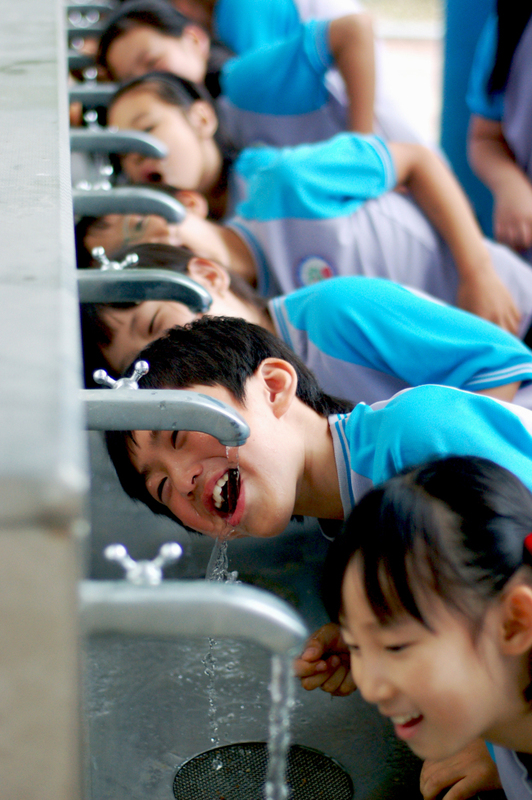 Children drink tap water in this stock photo provided by Seoul Metropolitan Government. This is not only above the World Health Organization’s recommended level but also more detailed than other countries, they said. In the U.S. and Japan, the number of water quality criteria monitored is around 111. The tap water drinking rate, however, is much higher than in Seoul. As of 2013, 82 percent of Americans and 78 percent of Japanese replied that they drank tap water. In New York, about 80 percent of residents drink tap water despite concerns about old water pipes (most of which are more than 100 years old) and chlorine use, the officials explained. For instance, more than 4 milligrams per liter of chlorine is added to water in New York for germ prevention, while Seoul keeps the minimum amount at 0.2 milligrams per liter. But this, which often leads to stronger chemical smell, seemingly does not deter New Yorkers from drinking water from the tap. Americans have acknowledged that a small amount of chlorine does not pose health issues and is an essential substance for disinfection, thanks to the government’s efforts to raise public awareness of this, the officials explained. Despite the authorities’ efforts to maintain the high quality of tap water, the public has preferred to drink water filtered through water purifiers or purchase bottled water. Some critics pointed out that such public distrust was triggered by the infamous phenol leak accident that prompted water scare across the country in the early 1990s. In 1991, an undiluted solution of phenol was leaked twice from an electronic component factory in Daegu into the Nakdonggang River. The accident caused extreme odors in the region’s tap water, and serious headaches and vomiting among residents who drank it. “Once a water accident happens in one region just like the phenol leak, it causes nationwide fear as water circulates the country, no matter how well the government responded to the accident. People who raise children especially react sensitively to water accidents,” said Chung Deuk-mo, the director general of Waterworks Research Institute, an affiliated organization of Seoul Metropolitan Government. Along with the phenol leak, aged underground pipes added to the water distrust following several reported cases of red water, experts said. As part of the efforts to guarantee pipe sanitation, the government has worked on replacing water pipes with new, rust-proof ones. “Those pipes aged over two decades are recommended to be replaced. Water flows through pipes upon pressure. Because massive pressure hits the pipes every day, the pipe connections can be twisted, chipped off or even rust,” an official from the Environment Ministry told The Korea Herald, wishing not to be identified. About 180,000 kilometers of water pipes are installed underground across the country, with 70 percent having been laid, replaced or improved in the last 20 years. About 30 percent are awaiting replacement, with most of them in private housing. Replacing the pipes at private housing is at each homeowner’s discretion, officials said. As pipe replacement for an individual home costs around 2 million won ($1,800), many residents have been reluctant to take the responsibility, citing cost burden. To encourage people to replace their pipes, city governments have offered subsidies for those wishing to replace them. In the case of Seoul, the city expanded the subsidy from 50 percent to 80 percent of the cost in an aim to complete the replacement by 2020, officials said. The capital has also completed more than 96 percent of the public water pipe replacement, due to be finished by 2018, with about 470 kilometers remaining, they added. While various factors have led to public distrust, one of the prevalent reasons that Koreans avoid drinking tap water is their sensitivity toward the unpleasant taste that derives from chlorine, experts said. “Many people tend to feel the unpleasant smell and taste from tap water because of chlorine. But chlorine is essential to ensuring water safety as it prevents bacteria propagation,” said water expert Lee Yoon-jin at Konyang University in South Chungcheong Province. 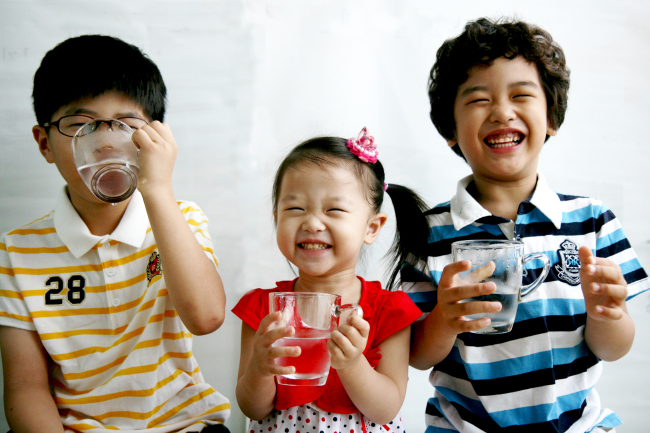 In order to have better tasting drinking water while avoiding safety concerns, many Koreans have installed water purifiers at home, thinking that smell-free water is likely safer. The scale of the water purifier market is around 1.5 trillion won a year, Seoul officials said. Experts, however, underscore that purified water is actually not safer than the tap water. “Water filtered through purifiers may seem safer but it can actually lower the water quality unless the filters are regularly replaced. The interior cleaning of purifiers is systematically not easy, and the purifier’s faucet can increase bacteria propagation as it is exposed to the air,” said environment engineering professor Choi Suing-il at Korea University in Seoul. In 2013, more than half of 100 water purifiers in Seoul were found to have had substandard drinking water, the capital’s random inspection report showed. A few were reported to have had about 110 times more germs than average, with one even having colon bacillus, the city said. “All water purifiers contain activated carbon to remove chlorine, which is the source of the chemical smell that many dislike. As the germ-fighter substance is eliminated, the water is naturally exposed to various bacteria and germs,” Choi added. The more serious problem of water purifiers is that some types of water purifiers even eliminate all the important nutrients contained in tap water, experts said. “Because tap water is sourced from rivers, such as the Hangang River, it contains various minerals such as calcium and magnesium, with around 20 to 30 milligrams per liter,” a Seoul City official said. Some express health concerns over the chlorine use but experts highlight that a small amount is harmless. “Chlorine is a chemical, therefore it can be harmful to health if one is over-exposed. One study showed that it can be detrimental if people are constantly exposed to chlorine over 3,000 ppm over a long period. But unless more than 1,000 milligrams per liter or 1,000 ppm is added to the water, there’s no need to worry,” said Kim Dong-keun, the general director of Citizens Network for Tap Water, adding that bacteria contamination of water due to a lack of chlorine could be more harmful. The government, meanwhile, continues to put efforts into promoting the safety of tap water. Seoul City, for instance, announced last month it would provide free-of-charge quality tests for tap water at some 300,000 homes and improve their water supply facilities. It has also signed up for an insurance to compensate citizens who suffer damage from any water pollution. The city has been providing bottled tap water since 2001, branding the products under the name Arisu in 2004 to rehabilitate its image. In March this year, Seoul Mayor Park Won-soon joined a network of some 72 government organizations and civic organizations to only use tap water by installing Arisu drinking fountains at all of its office buildings. Civic groups stress that achieving the cleanliness of tap water and enjoying it is a basic right of the public. “Improving the tap water credibility and expanding the culture of drinking tap water is crucial. Having safe water is not only a basic public right but also part of welfare. People should realize the importance of the cheapest, yet the most vital, benefit to their daily lives,” said Kim.